Kim is looking for the Spotted Zwibble Dibble, seen here playing a Pirate. 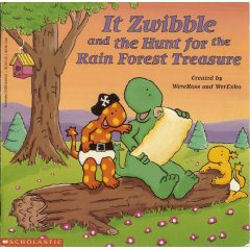 I am looking for the It Zwibble Dibble that was polka dotted, named Orbit. My daughter and I tried to find one for years and gave up. Now I am trying to find 2 -one for her and one for her cousin for Christmas. I believe he was a medium size, not as large as the yellow one, had a diaper with the stars on, and I believe he had black? spots. But since I never saw him in person, only in a book that has been packed away for years, this is all I recall. I do recall he played a “pirate” in one of the books. I have a disease that prevents me from walking too long, so this is my resource.